What is the value of primary sources? Module 1: What are primary sources? Primary sources are what remain from the past. Aside from human memory and the unrecorded passing down of information from generation to generation, histories based upon primary sources are really the only way the current generation can hope to understand what happened before. Those who are not professional historians have the option of relying on others to find this evidence from the past and interpret it. But many people find it more fun and interesting to have direct contact with the historical records themselves, because they value learning about historical events in the words and images of the direct participants. Besides, everything worth finding out about hasn’t been written in a history book or journal– not by a long shot! 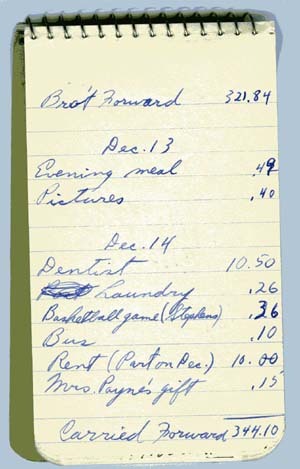 This is a notebook in which Allan Hicks kept a record of all of his expenditures when he was a student at UIUC in the early 1940s. While it may not seem like the most interesting reading, we can learn a lot about past student life from records like this.